In the last few weeks, we have received several frantic emails from readers who don’t have thumbnails of the images showing anymore. Well, for some reason there are a lot of Windows tips & tricks sites recommend settings changes that either make no sense or make things harder on Windows users. Why make things harder, right? We are all for making things easier and we are against trying to show you how geeky we are. We’re here to help. I digress – let’s get back to thumbnails. There is one setting that enables & disables thumbnails in Windows. 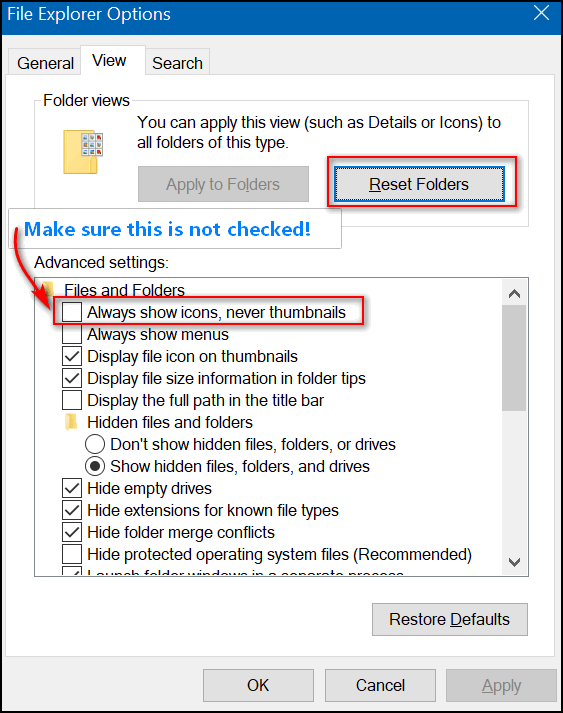 And regardless of what view you choose in Windows Explorer (Windows 7) or File Explorer (Windows 8x and Windows 10), you won’t see thumbnails if thumbnails are disabled. Open Control Panel, change from Category view to Icon view, click on Folder Options then click on the “View” tab. In the taskbar search (Cortana) type Folder Options, when File Explorer Options appears at the top, press enter. In Folder Explorer Options click on the “View” tab. Now your thumbnails, in all their glory, will be back. And if you find thumbnails as useful as we do, you’ll be happy.